Honoring 150 years of the national pastime, 2019 Donruss Baseball pays tribute to past designs from its history as well as current and future MLB stars. According to Panini, it also has a few tricks up its sleeve. 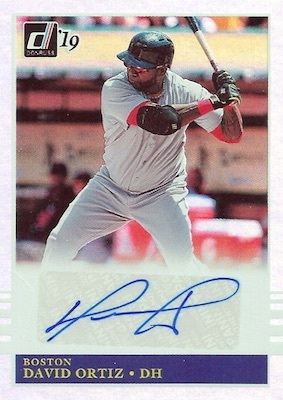 Just as in 2018, the Hobby format again offers three hits that can be autographs or memorabilia cards. 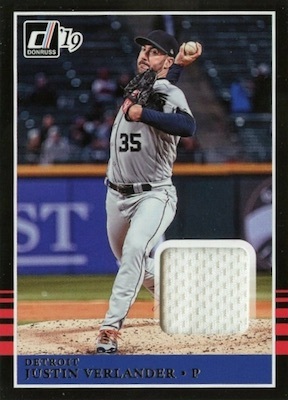 Promising the "deepest checklist to date," the base set in 2019 Donruss Baseball expands further with new 42 Tribute and Holo Back parallels. The special 150th Anniversary parallel is printed on clay coat stock. Additional parallel options include Artist Proofs, Press Proofs, Season Stat Lines and Career Stat Lines. 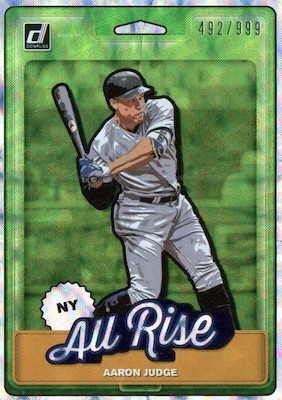 The popular Rated Rookie subset includes pink-framed Mother's Day Ribbon versions. Base variations remain an easy find at roughly one per pack. 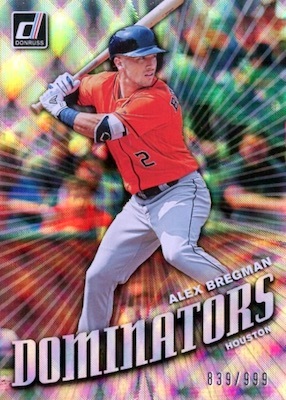 2019 Donruss Baseball continues with the artistic Diamond Kings, the vivid Dominators and Elite Series sets, each for 10 top players, and the throwback Retro 1985. New inserts include Action All-Stars, Franchise Features and Highlights. A returning favorite, the tough-to-pull Whammy offers five rare subjects. 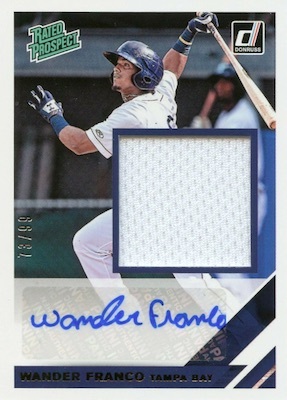 Filling in much of the autograph content for 2019 Donruss Baseball, the main lines include Signature Series, which highlights budding stars, and Retro 1985 Signatures. Both sets have Blue (#/99 or less), Red (#/25 or less), Gold (#/10 or less), Green (#/5 or less), and Black (1/1) parallels. Collectors can also find Majestic Materials, Rated Prospect Autographs/Relics and San Diego Chicken Autographs/Relics among the hit selection. 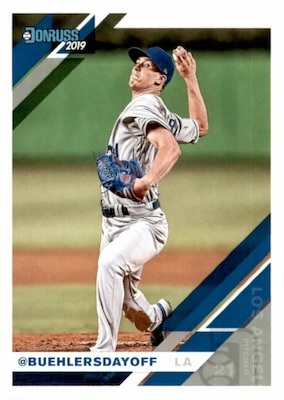 Bringing back earlier cards that have since been hard-signed, Recollection Collection is a buyback set randomly inserted in 2019 Donruss Baseball. 2019 DONRUSS BASEBALL YUSEI KIKUCHI Retro 1985 Rated Rookie Auto 250!!!! 2019 Shohei Ohtani Autograph And Aaron Judge Autograph Panini Donruss Pair. PARALLEL CARDS: Independence Day, 150th Anniversary #/150, Holo Back #/99, Father's Day Ribbon #/49, 42 Tribute #/42, Mother's Day Ribbon #/25, Artist Proof #/10, Press Proof #/5, Printing Plates 1/1. HOLO PARALLELS (only #31-250): Holo Orange, Holo Pink, Holo Purple, Holo Red. 50 cards. Full guide and gallery. Buy 2019 Donruss Baseball autographs on eBay. 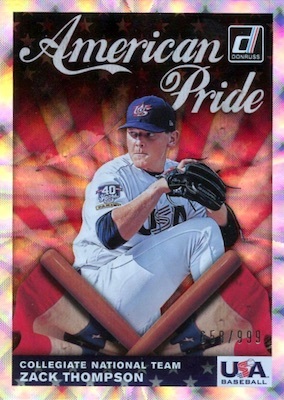 PARALLEL CARDS: Pink Firework, Blue #/99 or #/49, Red #/25, Gold #/10, Green #/5, Black 1/1. PARALLEL CARDS: Gold #/99, Black #/10 or less. PARALLEL CARDS: Pink Firework (No Ichiro*), Red #/25 or less, Blue #/99 or less, Gold #/10 (Ichiro #/5*), Green #/5 (Ichiro #/3*), Black 1/1. PARALLEL CARDS: Blue #/49, Red #/25, Gold #/10, Green #/5, Black 1/1. PARALLEL CARDS: Pink Firework, Blue #/99, Red #/25, Gold #/10, Green #/5, Black 1/1. Hard-signed and stamped buybacks from earlier sets. PARALLEL CARDS: Gold #/99 or less, Black #/10 or less. 15 cards. Serial numbered #/999. PARALLEL CARDS: Diamond, Pink Firework, Rapture, Vector, Bronze #/349, Blue #/249, Red #/149, Gold #/99, Green #/25, Black 1/1. 26 cards. Serial numbered #/999. 10 cards. Serial numbered #/999. 21 cards. Serial numbered #/999. 12 cards. Serial numbered #/999. 6 cards. Serial numbered #/999. 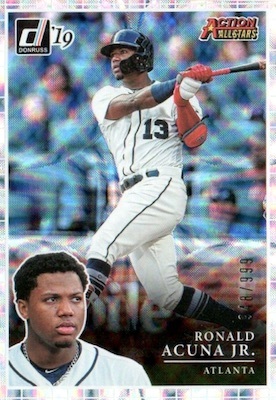 View the 2019 Donruss Baseball checklist Excel spreadsheet. 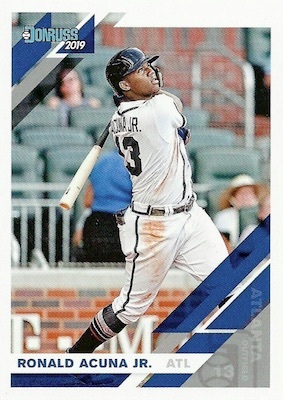 I hope for the “deepest checklist yet” – There is room in the hobby for this set. This is my go to for a “base set” type product. The design isn’t too different from the last couple of years but it’s pretty good looking still. Definitely a great value especially when your 3 hits are usually 2 autos and relic with a good chance of an extra hit and some bigger names on the checklist usually. I’m really looking forward to this product this year. 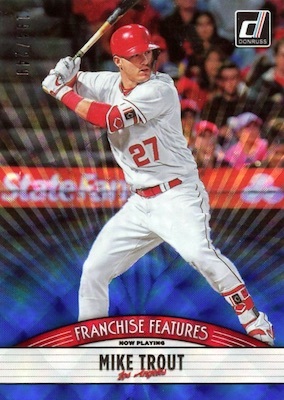 Cards look good but the lack of team logos and team names really hurt the product. Today’s kiddie card designers don’t know the first thing about design and typography. These cards are about as attractive as weeds (and more plentiful). STILL no checklist . only 4 days before here ! 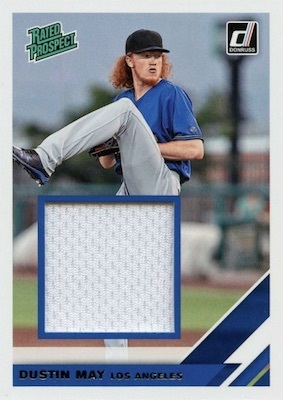 Agree w/ others that there’s room for Donruss and other entities in the baseball market (I wish they’d bring back Fleer, for instance), but the lack of logos is really hurting this product (unless you get a card where the player’s side or back is to the camera). Trey, did I read that Topps extended their contract w/ MLB? I was thinking that contract was due to expire soon and we’d see some real competition in the field. Topps extended their exclusive deal in July 2018. It now goes until 2025.
with the skyrocketing prices of topps baseball , this product has had a amazing checklist and is affordable to the casual collector . It doesn’t take a genius to figure out what team the card represents. Why is there no checklist for the recollection buyback autos? I seen Ichiro, Judge, Griffey Jr., Carew, and the late great Oriole Frank Robinson on ebay. I would think with names like that hard signed and low numbered that these cards would be some of the most desired pulls in the set. Panini should at least give us a list of names even if they don’t want to tell us how many or how FEW cards they signed. Tons of inserts and parallel cards inserted roughly one per pack. If you’re lucky busting packs you could eventually find something really nice with a low print run or a 1/1. More fun to open and more bang for the buck than topps. There’s a better chance, I think, you’d find more cards to get excited about opening a case of Donruss than if you went with topps. 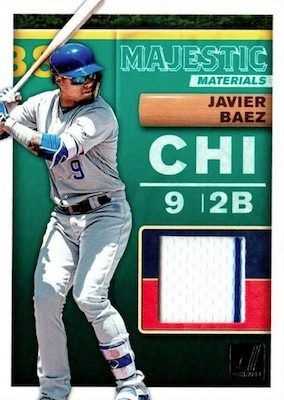 My biggest gripe with the lower end, base donruss and score cards is the relatively paper thin card stock. Fun set to collect! Takes everything that is exciting and popular in modern card collecting and puts it in one box. Hits, throwbacks, parallels, rookies, and limited base. It makes Topps look really stale in comparison. More of a question than a review. 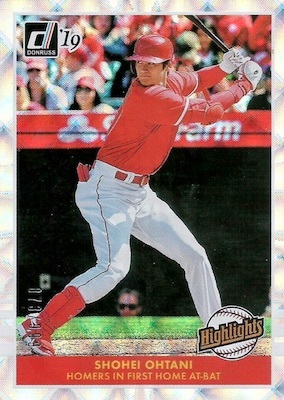 Are all copies of th Domingo Ayala card (#251) cool or refractor versions of are there base versions also? Most listings are indicating foil or refractor! 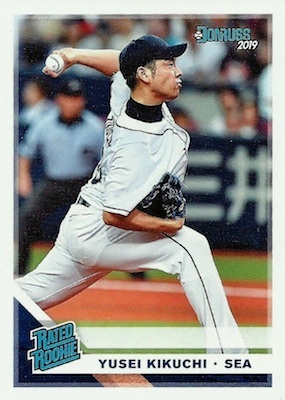 I’ve not seen a standard Donruss base, only the Foil version. 3 hits per box at this price point is what make this Donruss hobby box attractive. Why buy a single box for similar money and HOPE the 1 hit you’re going to find is half decent? Plus, there’s #’d cards galore here. I’ve shifted away from Topps slowly over the last year or so. Between the fatigue and frustration of pulling expired redemptions found in some of the older, more affordable hobby boxes from Topps, to Panini honoring redemptions Topps won’t, to Panini just giving us more fun cards per box, I’ve got a new favorite brand of card to collect. ANY word on wrapper redemption for 2019? Why does it take Panini so long to ship their cards to retail? It normally takes them 3 – 4 weeks from the release date to get them there. It only takes Topps about 3 days to. 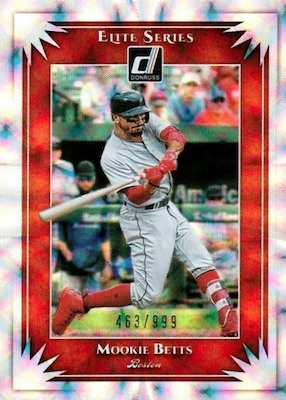 Today is the 3 week mark, so hoping I’ll finally find Donruss this week. Just want to know why it takes them so long. Do you know why, Trey? I do not. I would imagine it is to create a buffer for Hobby but only Panini has that answer. While it is hard to say before the season, I am more enthused about the checklist compared to the Topps flagship checklist. they never fail to show up here..
bottom line is Panini makes nice cards and a better break than most TOPPS product.. I would give 5 stars, but I just experienced a hobby box where the first 2-3 cards in each pact were damaged (the box showed no damage, nor did any of the packs). Is this normal? Does anyone know if there will be a wrapper redemption like last year? At this point, it is very unlikely given the uproar when it was revealed late last year. Love the product. One question: I have a number of cards with a blue border and white stars all around the entire border. I can’t find anywhere what these “subsets” are called. I checked Becketts website and can’t find anything on them either. The backs of them feel like vintage stock not as slick as the other cards. Any idea? That would be the Independence Day parallel noted in the parallel section. Thanks for your reply. I guess I was expecting them to have a flag or something on them. I guess I was lucky, I got the Juan Soto card. Hoping it might be something special. 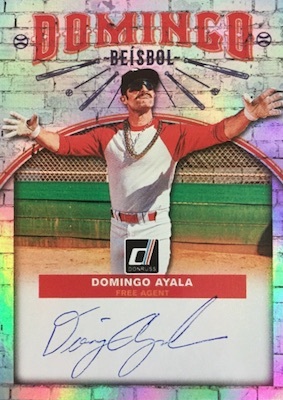 I go back and forth between thinking the Domingo auto is the worst or the best thing about this set. 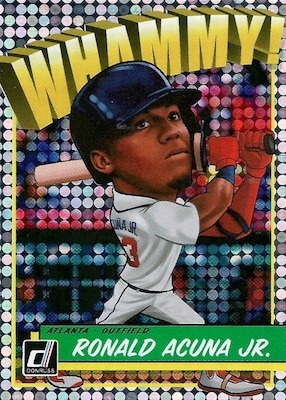 Give Donruss credit for creativity.